I am a huge fan of chocolate covered Oreos, you are giving a classic cookie a tasty make over! And let’s be honest everyone loves Oreos! These Chocolate Covered Oreos topped with crushed peppermint candy canes are the perfect Christmas treat. If you have a party that you are headed to and want to wow everyone, these easy chocolate covered Oreos are perfect. Only a few simple ingredients are needed to make these Chocolate Covered Peppermint Oreos! I am in love with Oreos and when you cover them in chocolate they are just to die for! Seriously they are one of the best ways to eat an oreo cookie. With the combination of chocolate and peppermint they taste like a thin mint cookie but better. 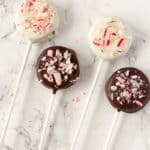 You don’t need many ingredients to make chocolate covered Oreo pops, all you need is melting chocolate, crushed candy canes and of course Oreo Cookies. 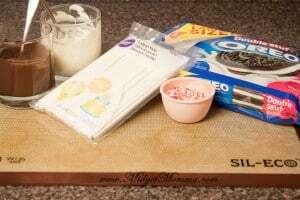 When making chocolate covered Oreos, it is important to use parchment paper or silicon mats. You do not want them to stick to the surface you are putting them on after you dip the Oreos in the chocolate. 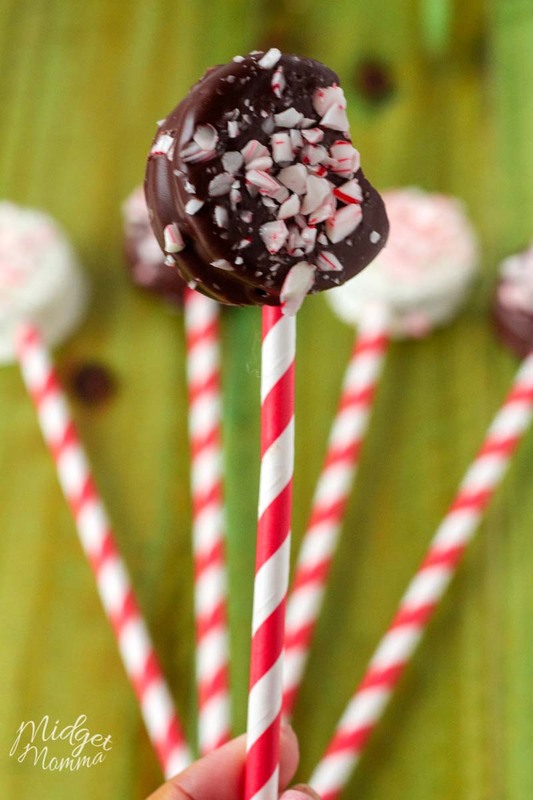 If you are planning on just making Chocolate Covered Peppermint Oreos you can skip the step for putting in the lollipop stick. When you are taking apart the Oreo cookies, you want to be careful. Oreo cookies break easily, so do not rush when you are taking them apart. The best way I have found to melt chocolate is by using a double boiler. I find that it melts chocolate more evenly then melting chocolate in a bowl in the microwave. If you have never used a double boiler then make sure you check out how to melt the chocolate. You will probably never melt chocolate in the microwave again once you use a double boiler, it is so much easier! Personally I find the double stuffed Oreos work best for making chocolate covered Oreos. I like the extra bit of cream filling that they have. You can use the regular Oreos, if you want to and that is what you have on hand. As for the chocolate, you can use milk chocolate melting chocolate, dark chocolate melting chocolate or white chocolate melting chocolate. I also like yo have a big bag of lollipop sticks on hand, I tend to be spur of the moment sometimes when I am making treats, so having them on hand allows me to do that. It also makes it so when we find out about a last minute holiday party we are going to, I know exactly what treat I am going to make to bring with us. 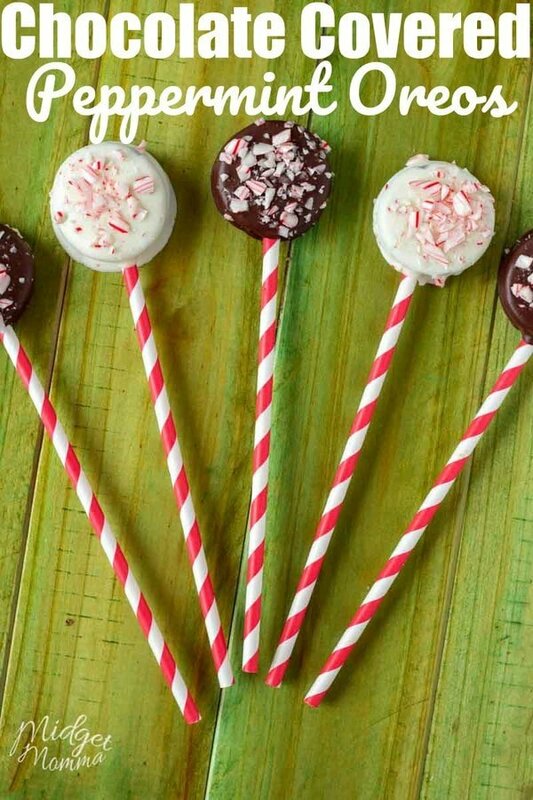 We love these Chocolate Covered Peppermint Oreos! 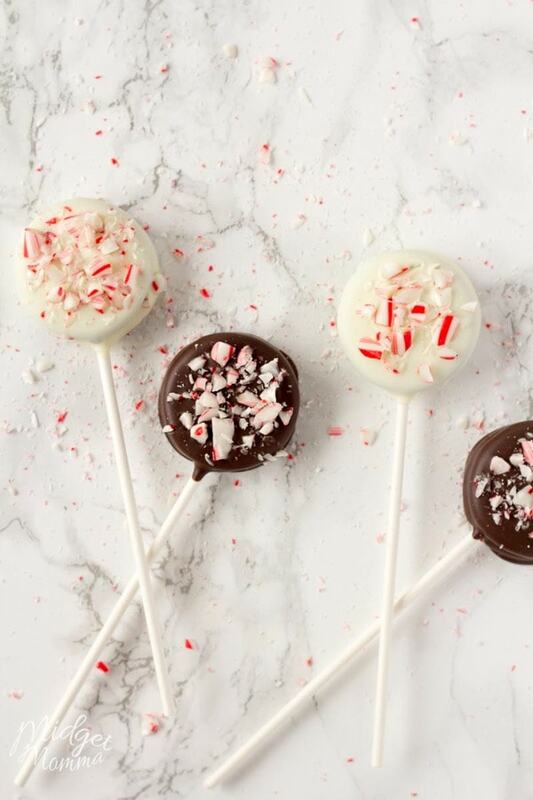 These Chocolate Covered Oreos topped with crushed peppermint candy canes are the perfect Christmas treat. 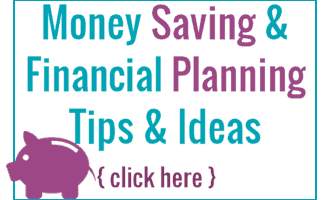 Get out 2 or 3 cookie sheets and line them with parchment paper or silicon mats. Very carefully twist the tops off of all the Oreo's and set all of the Oreos on the prepared cookie sheets. Don't over crowd them, you do not want them touching each other when you put them back on the silicon mat. Melt 1/2 cup chocolate over a double boiler. 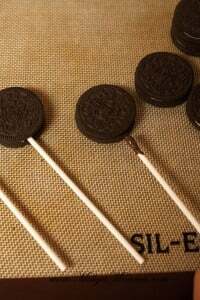 Once chocolate is melted dip the end of a lollipop stick in candy and gently push it into the cream side of the Oreo half way in and all the way down.Then top the blank side of the Oreo with a small amount of chocolate and sandwich it with the other side of the cookie. Do this for all Oreos and then let them sit for 10 minutes. Once the 10 minutes is up and your Oreo cookies have hardened, melt the remainder of your chocolate using a double boiler. Then dip the Oreo into the melted candy, turning to cover them completely. Tap the stick on the edge of the container to get of the extra chocolate carefully. 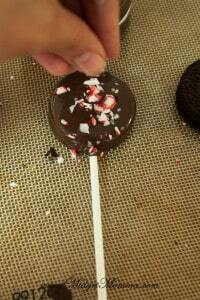 Set the dipped Oreo Pop on it's back on one of the prepared cookie sheets and sprinkle with the crushed candy cane. 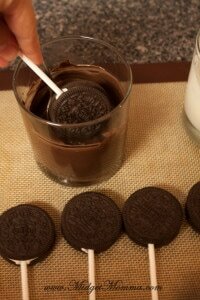 Do this until all Oreo Pops are done. Let sit on silicon mat for 30 minutes, until all chocolate has cooled and hardened. Then you can use plastic treat bags to make them travel friendly or store them in an air tight container. 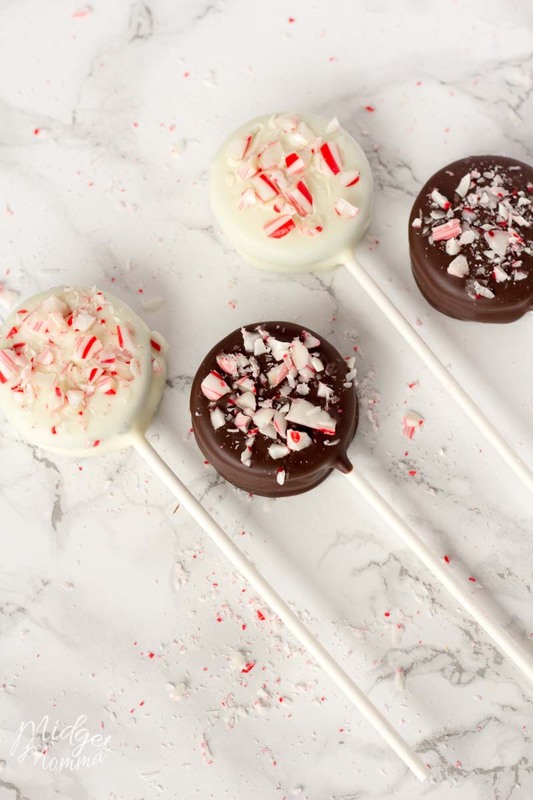 If you are not making the Chocolate covered Peppermint Oreos into pops, skip the first steps for inserting the lollipop stick and use a fork to dip the Oreos into the melted chocolate. Looking for more Christmas desserts? Check these out! When does Elf on the Shelf come? And everything else you need to know about the Elf on the Shelf! You can have a lot of fun calling Santa with Santa’s Phone number and it is FREE! if you are stuck on Elf Names, Check out this awesome list of 110 Elf on the shelf names! We have girl elf on the shelf names and boy elf on the shelf names!